Personality beats practical experience was conclusion of a study by Xerox. It sounds odd. As a result, the practical experience in the application process was not considered to test and optimize by Xerox which returned good result. More and more executives rely on algorithms in their decisions and thus create competitive advantages. The analysis of large amounts of data provides important information and reveals previously unknown relationships. Big Data may enable optimal assignment of an employee to a job making the role of Big Data in Human Resources a point to evaluate. Not only ERP systems but also companies databases in unstructured data froms, for example, social networks or non-company computers are sources of data. Even if such an analysis is initially more complex, additional information can be obtained that may be relevant for personnel-related decisions. Even non-personal data, such as traffic or demographic factors, may be included in the calculation. There are different application possibilities. 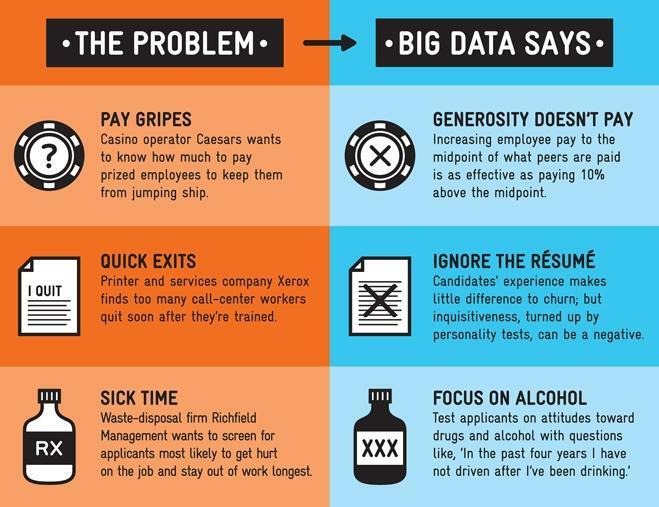 Big Data enables the optimal assignment of an employee to a job. The evaluation of the data of employees such as training, interests, abilities with other internal and external data can avoid undue and excessive demands. Combining the job profiles with the personal goals of the employees poses a challenge for the HR department that can overcome big data. Big data enables predictions about the development of relevant variables such as future personnel costs or staffing needs. Predictive analyzes enable a proactive HRM that identifies opportunities and risks at an early stage and anticipates appropriate measures. Recruitment as one of the core tasks of the HR department today which faces new challenges. With demographic change, HR will increasingly have to deal with this task. This costly and time-consuming task can be mastered better with Big Data. The analysis of previous recruitment activities as well as the evaluation of external data such as social media make it possible to get to know the target group better, to choose appropriate recruiting channels and to make the right decisions. The benefits of the mission can not be answered flat. The decisive factor is which objective is linked to the use of big data, but also how big data is actually implemented in the company. Likewise, the use includes hurdles and risks. Data protection plays a central role in Germany and companies not only have to deal with the organizational and technical implementation of Big Data, but also understand and consider the legal aspects that are diverse. Without cooperation with the representation of interests of the workforce an implementation is only possible with anonymous data. In addition, employees who are unconvinced of big data use can prevent, delay or reduce the amount of data generated. Consequently, it must be clearly communicated which data are used in which form and in which case the use of big data finally benefits everyone. When properly used, there is immense potential in the use of Big Data, as evidenced by the above example. Cite this article as: Abhishek Ghosh, "Big Data in Human Resources," in The Customize Windows, May 14, 2018, April 23, 2019, https://thecustomizewindows.com/2018/05/big-data-in-human-resources/.